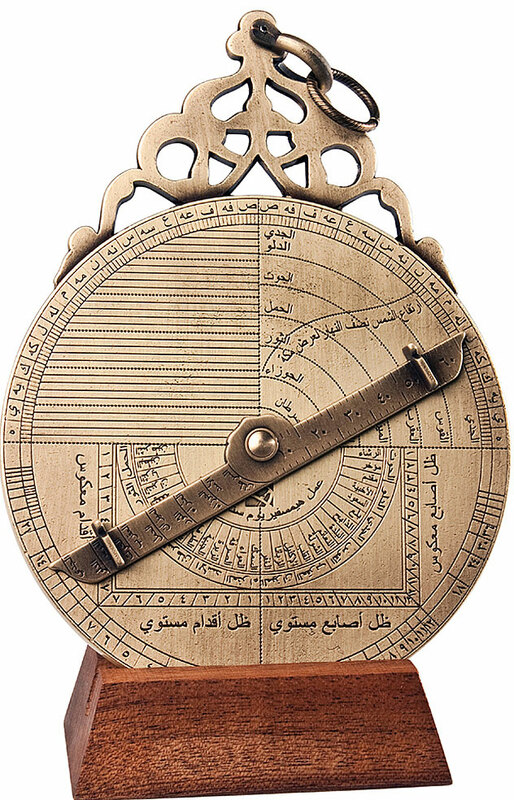 Reproduction of an astrolabe realized by Diya'al Din Muhammad in 1647. An original specimen of this astrolabe is carefully guarded in the Adler Planetarium and Astronomy Museum in Chicago. Almost all the inscriptions on this astrolabe are in arabic language (translations available in the user guide). 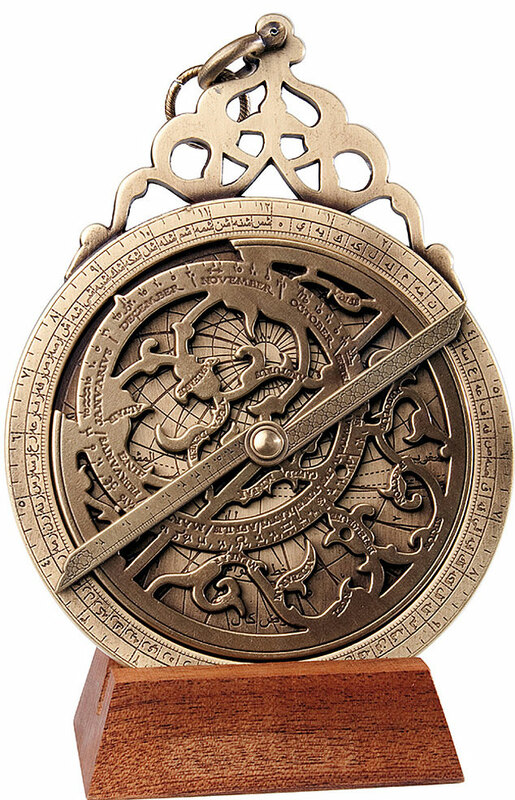 An astrolabe is a very ancient astronomical computer for solving problems relating to time (what time is it ?) and the position of the Sun and stars in the sky. Astrolabes are used to show how the sky looks at a specific place at a given time. To use an astrolabe, you adjust the moveable components to a specific date and time. Once set, much of the sky, both visible and invisible, is represented on the face of the instrument. Typical uses of the astrolabe include finding the time during the day or night, finding the time of a celestial event such as sunrise or sunset and as a handy reference of celestial positions. The typical astrolabe was not a navigational instrument although an instrument called the mariner's astrolabe was widely used in the Renaissance. The history of the astrolabe begins more than two thousand years ago. The principles of the astrolabe projection (stereographic projection) were known before 150 B.C., and true astrolabes were made before A.D. 400. The astrolabe was highly developed in the Islamic world by 800 and was introduced to Europe from Islamic Spain (al-Andalus) in the early 12th century. It was the most popular astronomical instrument until about 1650, when it was replaced by more specialized and accurate instruments. The sky map of this astrolabe is the one of the 21th century. This astrolabe is fully functional. for the North latitudes out of this interval. Attention to detail, historical interest, beauty of forms characterize this very fine Astrolabe, shipped complete with a hardwood display stand and a user guide with ad hoc exercises ( ). Introduction, description: different components, stereographic projection, main function: how to get time in 5 steps, other functions, history, conclusion. Mater, Alidade, Plate, Altitude, Azimuth, Horizon, Zenith, Tropic and Equator, Rete, Ecliptic, Fixed Stars. Average of 4,6 based on 15 reviews. Very recommended. Will come again to buy some items.